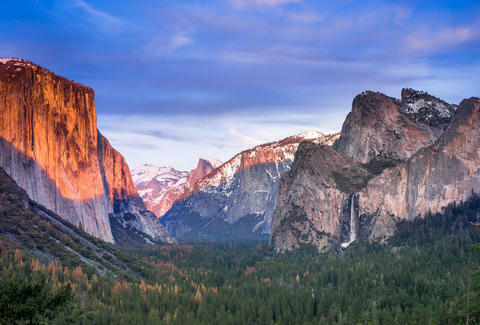 Yosemite, as you probably know, is a freakishly beautiful national park visited by around 4 million nature lovers (and some family members of nature lovers... ) a year. That's a lot of potential latte purchases for a brand like Starbucks, and word has recently spread that the massive coffee chain is looking to capitalize on them with a Yosemite location. At least 12,500 people are not fans of this idea, as you can see in this Change.org petition. The petition takes an aggressive stance: "Multinational corporations have no place in our National Parks... The Park will lose its essence, making it hardly distinguishable from a chaotic and bustling commercial city." It also urges the park to consider local establishments instead. "Starbucks, or any big committee retail entity, just doesn’t fit in Yosemite," one of the petition signers said in a comment. "Why spoil Yosemite, a place where people can go enjoy nature with Starbucks, the symbol of blatant consumerism that those same people see every Monday through Friday on their way to their cold and depressing cubicles." Apparently this won't be a full-blown Starbucks store, which makes the whole part about the "chaotic and bustling city" sound a bit hyperbolic. It's part of Yosemite Hospitality's overhaul of the food court in Yosemite Valley Lodge. The food court will be called Base Camp Eatery and open in spring 2018. "The petition is not an accurate representation or reflection of what is being planned," David Freireich of Aramark, the company that runs Yosemite Hospitality, told Thrillist over email. "The Starbucks offering will occupy existing space. No new structures or free-standing stores are being built as part of the food court renovation." Starbucks and Yosemite Hospitality plan to move forward with the opening and stress that Starbucks will work closely with the park and build the Starbucks according to LEED (Leadership in Energy and Environmental Design) standards. A job posting for a manager role at the store is up on Indeed, but reads, "This job posting is no longer available on Aramark." James Chrisman is a News Writer at Thrillist who has yet to be the subject of a petition. Send news tips to news@thrillist.com and follow him on Twitter @james_chrisman2.